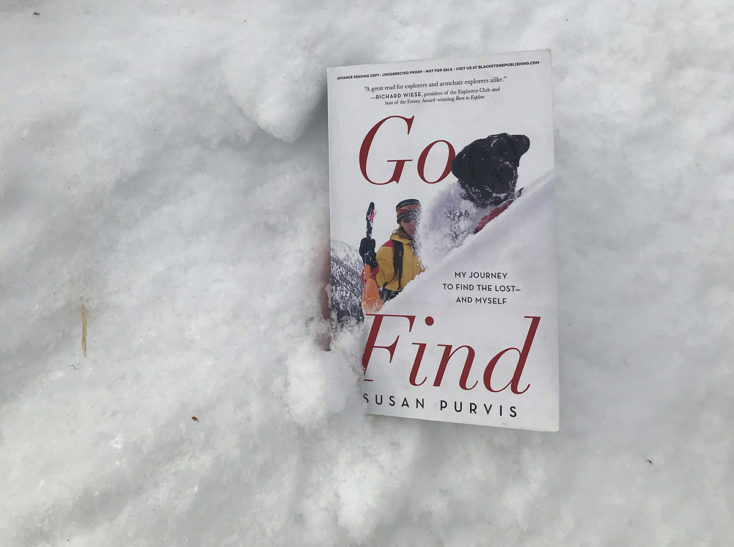 So goes the unofficial theme of Susan Purvis’s new book exploring her evolution from avid outdoorswoman to search and rescue goddess and avy/search dog icon. “Go Find,” has been called an adventure book by some. Is there adventure in it? From a successful bow hunt for elk to evading armed men while digging for gold in the Dominican Republic to getting heli-ed onto a rowdy couloir for the purpose of finding the last victim of a small plane crash, yeah, there’s adventure. But this isn’t an adventure story; what Purvis has written transcends that somewhat-niche genre. In the end, Purvis’s new book is a story about family, a story about communication, a story about the unspoken connection. It’s a love story about the once-in-a-lifetime connection between Sue and Tasha. And it should be noted that Tasha was a dog. If you’ve ever lived in a mountain mecca, you’ve no doubt met a space cruiser worth of strong, impressive people with unique life stories. But even among those iconoclasts, Purvis’s story would be one of the most memorable. Following an introduction pulled from her history as a wilderness counselor for at-risk children, we truly first meet her as she’s splitting her time between mountain living and searching for gold in the Dominican Republic with her alpha dog husband, Doug. Purvis, tired of the constant danger and heat and exhaustion of being a woman in a macho world (e.g. her story of claimjumpers on horseback with rifles staring down the blond woman), she decides to adopt a puppy. That wild little pup, Tasha, would send Sue down a voyage of self-discovery she never could have bargained for. As fate would have it, shortly after adopting Tasha she would decide to apply her wilderness survival training and join the Crested Butte Search and Rescue team. Learning about a few local tragedies would lead her to the discovery that not only could an avy rescue dog be more valuable than even the most advanced avalanche beacon technology and search skills but that she wanted to prevent with future tragedies. While we can predict how the journey ends — this book takes place in the late 90s/early 2000s so Tasha’s death will have to come along — the story is still full with plenty shock and surprise, and even if you know where you’re going, getting there’s where all the fun is anyway. And where did I get? To the discovery of how badly the avy world needs more strong women and more dog teams. I should mention that we first received this book because Mountain Weekly’s editor in chief Mike Hardaker participated in an avy safety panel at SIA in 2017. Ms. Purvis approached Mike to explain that she loved his message about avy-awareness and told him that she was writing a book about avy safety and specifically about her experience training an avy dog. We love the idea of more women making their way into the male-dominated avy safety world (as epitomized by the makeup of that specific SIA panel being all male). Even if she had just been one of the few highly-respected female SAR and avy safety gurus, that would make Purvis a legend. But her hard work and persistence that made her one of the top people in her field is a testament to her individual spirit (though it should be noted that she forms a strong friendship with other female dog-SAR teams, which leads me to believe that perhaps this aspect is one area where women are making bold steps forward). The struggle and the sacrifices she makes along the way are awe-inspiring. And you can’t help but be fascinated by her journey to learn to speak dog, and how she and Tasha prove that the avy dog is an indispensable SAR “tool” even more valuable than a search beacon. I mean, did you know that dogs can even search by scent underwater? As I said, this is a love story about the special bond between a woman and her dog, a bond that is only forged through a lot of elimination in other facets of her life. It’s also a story about avy safety and ego, and the mountain life in general. At times Purvis seems like she has a bit of a bone to pick with various people, from partners to egotistical members of the mountain safety establishment, which makes it feel a little one-sided. And if you’re looking for an outdoor adventure book, the Boardman-Tasker Omnibus this is not. But if you have even a passing interest in outdoor rescue and safety, this book is for you. If you like stories about women who fight their ways to the top of male-dominated fields, this book is for you. And if you want to see a brand new twist on the human-dog genre, Sue Purvis’s “Go Find” hits the spot perfectly. Especially when you realize that everything we learn in the wilderness applies to the dangerous truth of simply being a human. You nailed it. 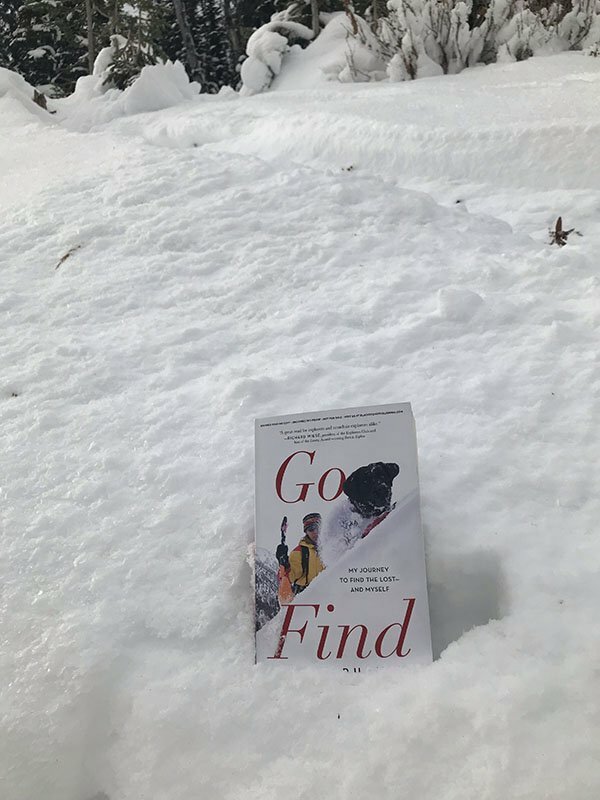 Thanks for the review of Go Find.